Mr. Qu Zhibo from the great city of Zhigong in Hainan province has a dream; to have his own Hummer. He didn’t sit down and wait for money to fall from heaven. Not at all, indeed. 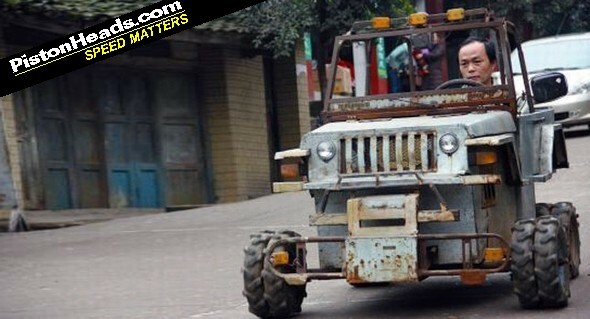 Instead he built his Hummer himself, completely from scrap, with a small tractor engine that drives the rear wheels. Qu’s Hummer is 2 meters long and 1.5 meters high. The building process took three long years and 4000 yuan, that is 630 US dollar. Lotta time and a lotta money, but Qu got it.